Brazilian cartoonist Gustavo Duarte’s comic book Monsters, reviewed. The gleefully gruesome comics of Gustavo Duarte. Illustration by Gustavo Duarte. Courtesy of Dark Horse. It’s telling that the foreword to Brazilian cartoonist Gustavo Duarte’s rambunctious, gleefully bloody new book Monsters! and Other Stories is written by Sergio Aragonés, the legendary gag cartoonist for Mad magazine. Duarte, like Aragonés, specializes in the laugh-out-loud comics moment—the perfectly posed juxtaposition or perfectly timed anvil-drop that makes readers not just smile or titter but guffaw. While reading Monsters!, a collection of three silly and gross stories, I embarrassed myself by guffawing on the subway, and then again by guffawing in my office. A farmer is transformed by visitors from another planet, then transformed again by … well, the thing that transforms us all, in the end. A pair of businessman-birds flee in terror from the gruesome fate that stalks them through their office. And in the title story, the longest, a trio of giants from the deep wreaks havoc on a city, and a weary hunter must go to work yet again. In their deadpan humor and crack comic timing, the stories will remind readers of Hellboy and The Incredibles, but Duarte’s draftsmanship is all his own. His drawings are elegant, snappy, and cool, great examples of classic cartooning energy. We’re very pleased to have Gustavo Duarte illustrating the February issue of the Slate Book Review. Monsters! 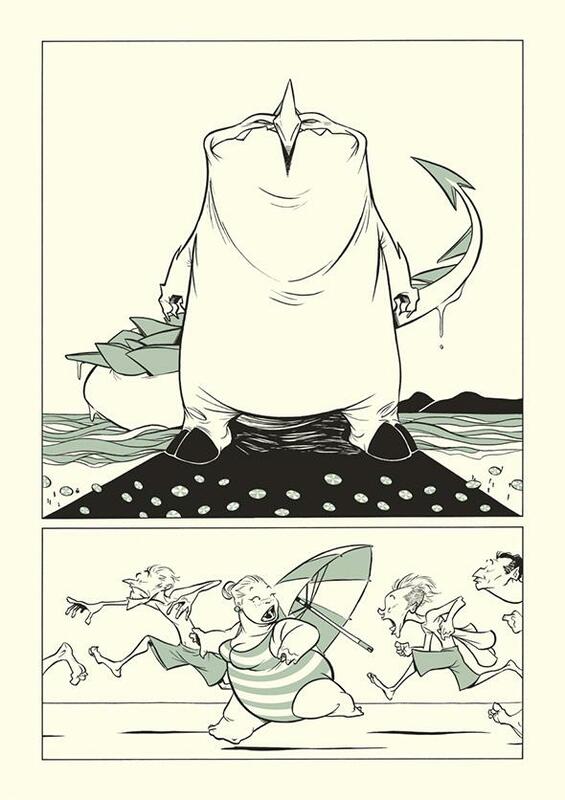 and Other Stories by Gustavo Duarte. Dark Horse.